Income Tax department visited the house of DMK leader Kanimozhi this evening to verify allegations of cash being stashed at her place. 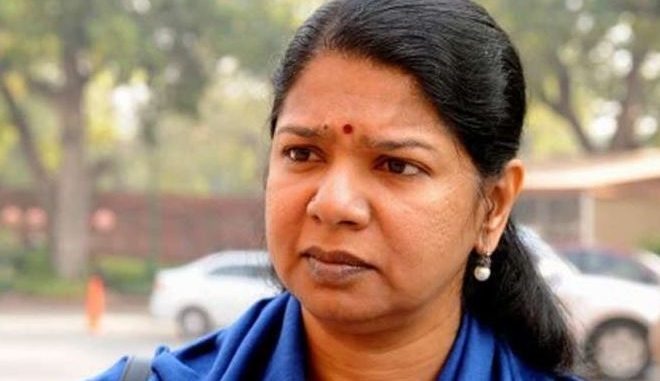 Kanimozhi, DMK lawmaker and the sister of party chief MK Stalin, is the candidate for the Tuticorin seat. There were allegations that a lot of cash stashed on the first floor of her house in Thoothukudi, however sources from the IT department claimed that it was a false tip. Tamil Nadu will vote for 39 Lok Sabha seats and 18 state assembly seats on the 18th of April. In a string of raids, illegal cash and gold worth INR₹ 500 crore were seized. Also today, voting for the Vellore Lok Sabha seat was cancelled after recovery of huge cash from associates of DMK candidate Kathir Anand, the son of DMK treasurer Durai Murugan. In Tamil Nadu, INR₹ 204 crore of unaccounted cash was recovered, however the IT department have not named any political party or candidates with regard to INR₹ 190 crore cash. Raids on opposition leaders was rampant in Tamil Nadu, most leaders accused the BJP of targeting political rivals through government agencies.